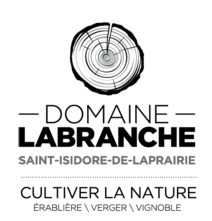 Domaine LaBranche was founded in 2009. It includes a maple grove, a cider works and a vineyard. Alcoholic beverages made on the premises are the products of the fertile land found on the estate in Saint-Isidore. Their products highlight the uniqueness of the Quebec terroir. True to their origins, the members of the DesGroseilliers family continue their adventure to present innovative and high quality products while deepening their expertise and working in total harmony with nature. Available at the SAQ, the Marché des Saveurs at the Jean-Talon Market in Montreal, and La cave à vins at the Market at the Old Port in Quebec City. Tours are self-guided, with explanatory panels on the paths in the vineyard. Autumnal vegetable and apple-based menu in the fall (September - October), and sugar shack menu in the spring (February - April). On weekends from September 16 - October 23 (Friday evening, Saturday and Sunday lunchtime), a 4-service (lunch) or 5-service (dinner) food pairing menu is available.